ON A ROLL: New Fortuner 4x4 large SUV starts at $47,990, offering a cheaper alternative to Prado and a diesel seven-seat alternative to Kluger. 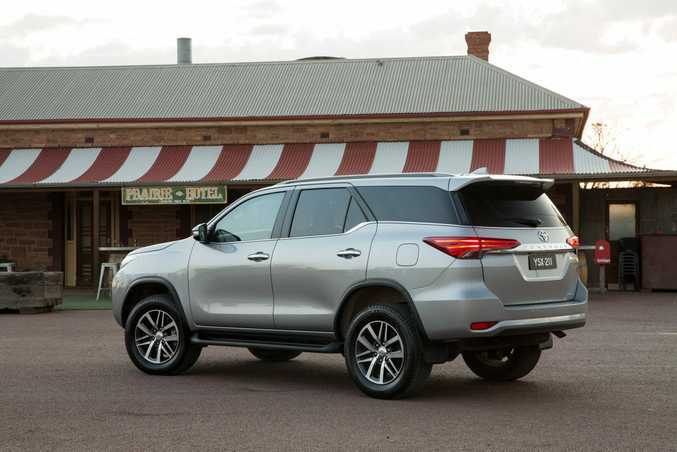 TOYOTA owns the large SUV segment in Australia. The Japanese giant secures over a quarter of all such sales with its Kluger, Prado and LandCruisers, but in true crushing style it's only gone and given us another one. Welcome the Fortuner. The all-new SUV model for Australia boasts seven seats, diesel engine, switchable four-wheel drive and at $47,990, a price tag $5000 cheaper than stablemate Prado and $7k lower than its market fresh Ford Everest rival. 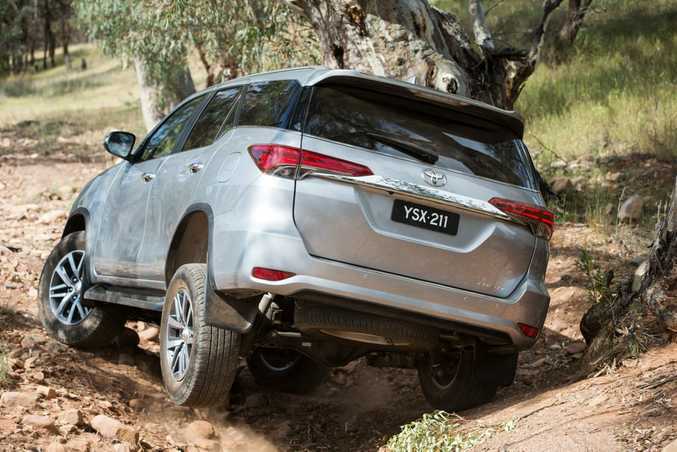 The imposing Fortuner has the same underpinnings and body-on-frame chassis as Toyota's new HiLux, but with a coil sprung rather than leaf sprung rear, hoping to balance genuine off-road ability with on-road comfort. But is it a model Toyota needs? Pre on-sale interest and deposits suggest so. Fortuner gives Kluger buyers the diesel alternative some crave, or aspirational Prado shoppers a cheaper entry into a talented 4x4 Toyota with seven seats. Price wise, the new model fits neatly between the two. 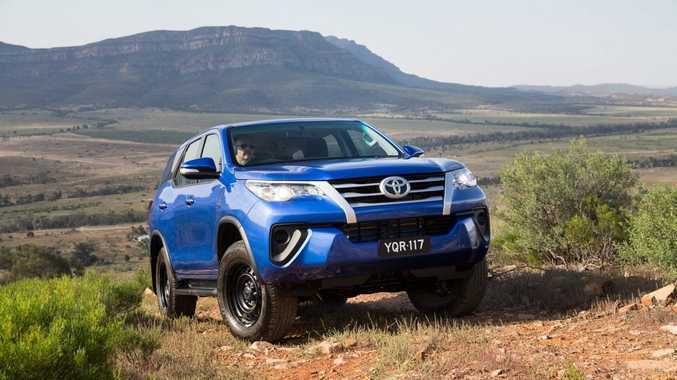 Launched in GX, GXL and Crusade levels, each come with Toyota's refined 130kW/450Nm 2.8-litre turbodiesel engine - also seen in the new Prado and HiLux - six-speed manual with optional auto, mechanical rear diff lock and towing capacity up to 3000kg. 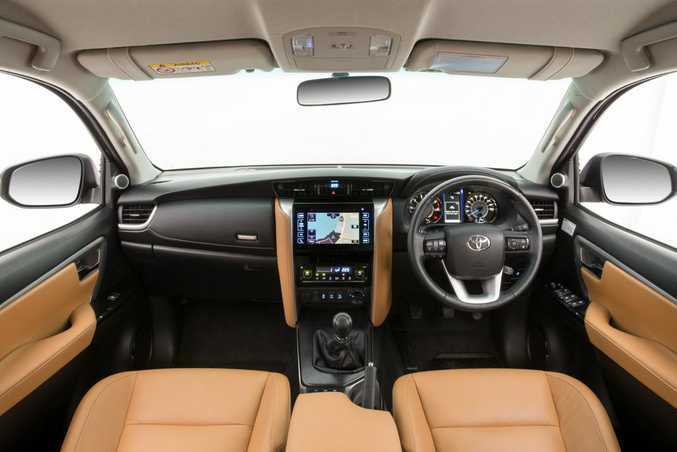 The Fortuner is similar in size and comfort levels to a Kluger, offering a 2-3-2 seating layout. You score cloth seats (brown, by the way) in GX and GXL grades, and they feel hard-wearing, nice and wide and reassuringly firm. Accented leather trim for Crusade will please wannabe Prado owners. The second row gives vast space, occupants sitting high with superb head room; and even my six-foot frame tolerated the third row of seats for a short journey. And despite its ute DNA, the Fortuner has enough style and quality feel in the cabin to satisfy SUV shoppers. Yes there are hard plastics for the dash and door tops, but lovely soft touch for the centre console and padded chiller box are ample compensation. The tablet style touchscreen is superb, the cool blue ambient lighting classy and for the Crusade, power driver seat and woodgrain-look highlights with the leather trim are a cut above. 2015 Toyota Fortuner. Photo: Contributed. The Fortuner wants to be all things to all people: an urban transporter and rugged off-road explorer, with comfort and ability in equal measure. No car can do it all perfectly though. Most integral, the Fortuner is wonderfully capable off-road, effortlessly clambering over steep climbs, tricky descent and rocky dry river beds in low range during our Outback test. 30-degree approach and 25-degree departure angles, 279mm clearance and 700mm wading depth shows no compromise. It would be a travesty to own a Fortuner and not go seeking adventure. 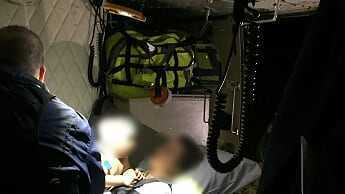 It shone on unsealed roads in particular, covering hundreds of kilometres in a stable, reassuring and comfy manner. The whisper-quiet diesel engine is a silky standout, and although the auto is a gem, buyers should at least try the new intelligent six-speed manual (iMT) which gives a throttle blip to match engine revs when shifting for smoothness - ideal for off-road fun and heavy load lugging or towing. Fortuner's on road manners are no match for bitumen-specific SUVs however, despite the coil sprung rear suspension. The car can't hide its high riding nature nor size, steering is light and vague, and feels unsettled at times through the turns. Overall though it remained comfortable, and its small on-road failings shouldn't concern buyers who prioritise off-road nous. 2015 Toyota Fortuner GX. Photo: Contributed. 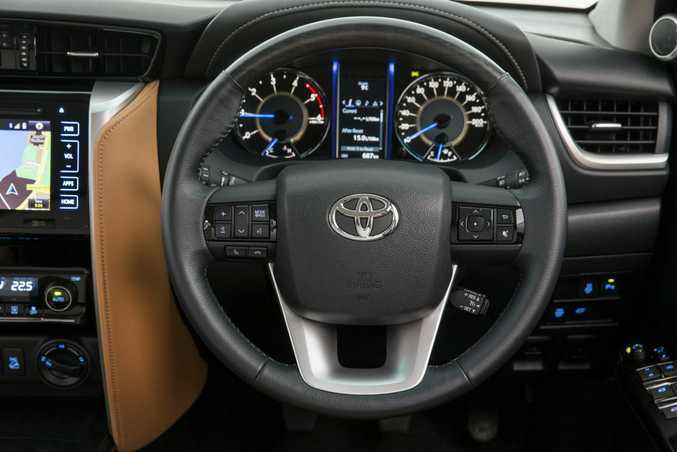 Standard across the range are air conditioning, cruise control, rear diff lock, seven airbags, reversing camera, hill-start assist control, 7-inch display audio with Toyota Link, bluetooth, air conditioned cool box, seven-seats and side steps. 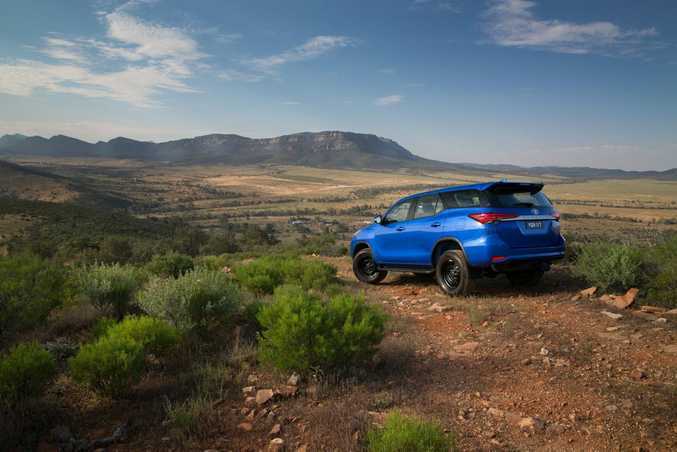 The GX comes with steel wheels and fabric seats, the GXL brings 17-inch alloys, downhill assist, paddle shifts for the auto (unusual faux sporty offering here), iMT, rear sensors, 4.2-inch colour MID, keyless entry and start, roof rails and front fog lamps. Range topping Crusade has 18-inch alloys, auto a/c, sat nav, DAB+ digital radio, power driver's seat and tailgate, LED running lamps, leather accented trim and woodgrain-look highlights. Fortuner's third row of seats fold to the side with a simple pull of a cord: easy for burly stockmen and soccer mums alike. 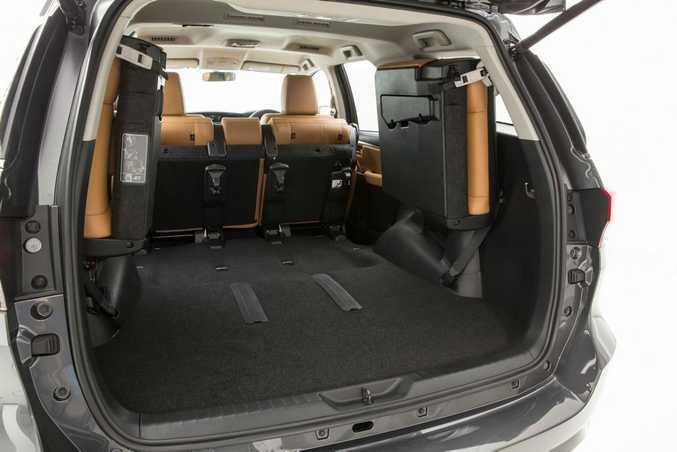 With these folded away you get 716-litres of space (compared to Kluger's 529-litres and Prado's 742-litres), while Fortuner also trumps its mates with towing ability - 3000kg for the manual and 2800kg (auto) versus 2000kg (Kluger) and 2500kg (Prado). Quoted fuel economy is from 7.8-litres/100km, but we always averaged above 10-litres in varying conditions. Fortuner competes with Ford's new Everest ($54,990), Mitsubishi Challenger ($42,490), Isuzu MU-X AWD ($45,600) and Holden Colorado 7 ($47,990) - all also ute-based SUVs. It will surely cannibalize its own too. Some buyers may have stretched to a Prado instead, and those who would have chosen a seven-seat Kluger - or even a double cab HiLux - may sign up for Fortuner instead. A polarising if intriguing style, the Fortuner shows Asian influence with lashings of chrome effects; thin, wide and sweeping lights front and rear, and that distinctive body kick up to the C-pillar. It's a style that grows on you the more you get used to it, and although despised by some journalists on our launch test drive, I feel the black steel wheels on the entry-level GX grade adds the required off-road retro toughness; the GXL and Crusade alloys shout urban show pony in comparison. Capable, well-priced, spacious and decent quality, the Fortuner looks like another winner. Perhaps Toyota should be referred to the anti-competition authorities with so much dominance in the large SUV segment? It gives potential Kluger and Prado buyers a diesel or cheaper alternative, and rivals like Ford's costlier Everest a real headache of a rival. What we liked: Australian engineered ruggedly capable off roader, refined diesel engine, general cabin comfort, sharp pricing. What we'd like to see: Fuel consumption was a long way off quoted, the steering wheel paddles suggesting a sporty side are a tad irrelevant. Warranty and servicing: Three-years/100,000km warranty. Model: Toyota Fortuner GX, GXL and Crusade. Details: Four-door all-wheel-drive seven-seat large SUV. Engine: 2.8-litre four-cylinder turbo-diesel generating maximum power of 130kW @ 3400rpm and peak torque of 450Nm @ 1600rpm (manual 420Nm @ 1400rpm). Transmissions: 6-speed manual or six-speed automatic. Consumption: 7.8-litres/100km (manual); 8.6-litres/100km (auto), combined. CO2: 205g/km (manual); 228g/km (auto). Towing capacity (braked): 3000kg (manual); 2800kg (auto). Bottom line: $47,990 (GX); $52,990 (GXL); $59,990 (Crusade). Autos in all adds $2000.